Internationally acclaimed violinist Nadja Salerno-Sonnenberg will perform at UNCG’s Aycock Auditorium on Friday, Oct. 23, at 8 p.m. as part of the 2015-16 University Performing Arts Series. Salerno-Sonnenberg will perform alongside the UNCG Symphony Orchestra and the Gate City Camerata, a professional-level faculty/student string ensemble. She will play two classic pieces: “Violin Concerto No. 1 in G Minor” by Max Bruch and “The Four Seasons of Buenos Aires” by Astor Piazzolla. 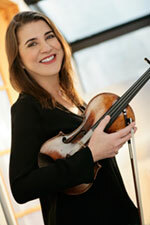 Salerno-Sonnenberg has enjoyed highly successful careers in both the solo and music chamber worlds. Widely recognized for her work on the concert stage, in the recording studio and as music director of the San Francisco-based New Century Chamber Orchestra, she is praised for her compelling, emotional performances. Salerno-Sonnenberg continues to expand the offerings of her record label NSS Music, a label that includes pianist Anne-Marie McDermott, horn player John Cerminaro and conductor Marin Alsop. According to Bagley, this performance is the opportunity of a lifetime for students. Ticket prices are $25 for adults, $23 for seniors, $15 for UNCG employees, $10 for non-UNCG students and $5 for UNCG students. Tickets can be purchased online at http://performingarts.uncg.edu/upas/ or by calling the Triad Stage Box Office at 336-272-0160.